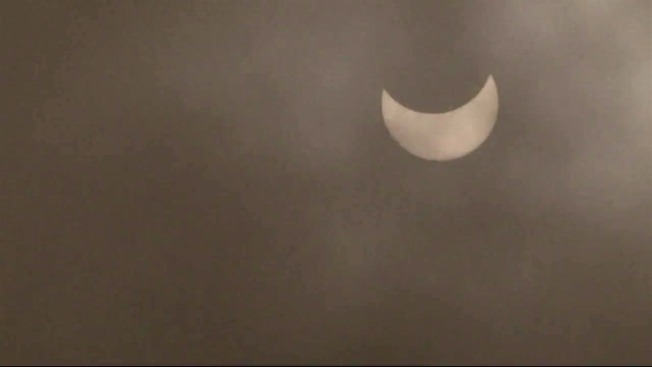 By Brendan Weber, Kirsty Fowler, Jennifer Gonzalez and Joe Rosato Jr.
Folks in San Francisco were forced to battle fog as they tried to steal a peek at the solar eclipse. Bay Area traffic briefly came to a stop Monday to witness the solar eclipse, as millions across the United States halted the start of the workweek to see the moon briefly take away the spotlight from the sun. For the first time in nearly 40 years, a solar eclipse was visible in the United States, sending astronomy enthusiasts and curious onlookers into a tizzy of astronomical excitement that was brewing for weeks, months and even years. The Bay Area was not in the path of totality this go around, but folks in the region were able catch portions of the eclipse between 9:01 a.m and 11:37 a.m. with the peak of the eclipse occurring around 10:16 a.m. Roughly 75 percent of the sun was hidden by the moon at that time. CHP Contra Costa tweeted out a picture of cars parked on the side of a freeway, with people getting out to snap a photo of the sun. "We truly hope everybody enjoyed their solar eclipse today which was barely visible due to our micro climate herein our Bay Area. But hopefully you were at your home, on a mountaintop, or in a safe location and not one of these people behaving badly. Can you say "Unsafe stop along the freeway for a non-emergency reason," CHP wrote on Facebook. "Wow is all we can say. How many tickets would you have written?!" 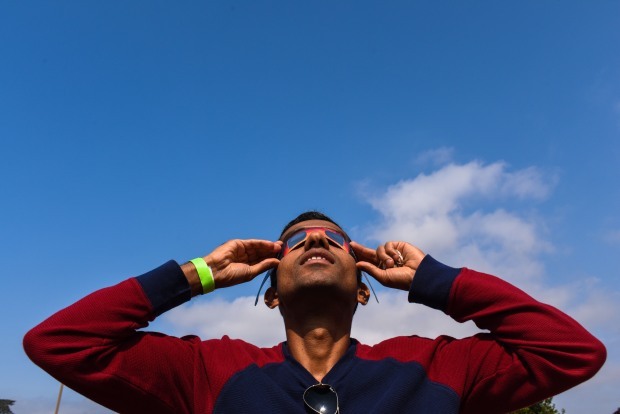 Droves of people gathered at NASA Ames Research Center in Mountain View to soak in the spectacle. Claire Dulsky, a youngster from San Carlos, had her protective glasses handy as she took a peek at the partial eclipse crossing over the sky. "I see like a bite out of the sun," she said, staring upward. "It's like a divet in the sun." Fellow onlooker Angela Wu of Los Altos noticed a similar site. "I'm seeing some cheese getting bitten by somebody," she laughed. In the coming weeks, scientists will be able to see how the atmosphere reacted to the solar eclipse, thanks to satellites, test balloons and other monitoring devices sent up by NASA and other agencies. According to NASA, a solar eclipse occurs when the moon moves in front of the sun, creating a barrier between the two orbs. The eclipse this year lasted no more than three minutes in its totality. 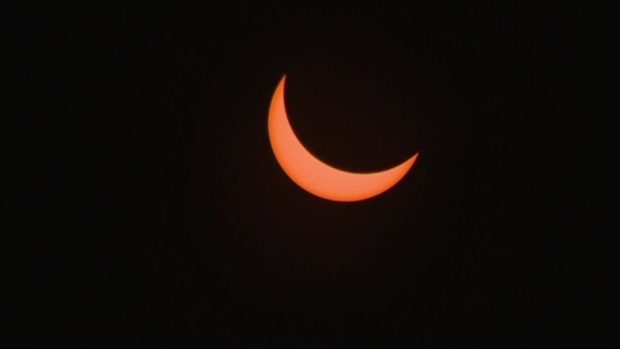 Along with being able to see the sun completely covered, viewers were exposed to a partial eclipse as well. That phenomenon displays the moon’s movements as it blocks out the sun. Where could the solar eclipse be seen? The total eclipse in America was visible in 14 different states, according to NASA. Although California wass omitted from this list (The last occurrence in California was 128 years ago), those wishing to experience the event travelled to Oregon. Other states where the complete solar eclipse could be seen were Idaho, Wyoming, Nebraska and Montana. The last location to be passed through was South Carolina. People who reached some of the gatherings needed special glasses to view the solar eclipse. Only when the moon was completely covering the sun could spectators remove their glasses. Slowly but surely, the moon crossed in front of the sun Monday, leaving a temporarily path of darkness across portions of the United States. If looking to grab memorabilia of the event, the US Postal Service has released a stamp set of the total solar eclipse. The exclusive sheet holds 16 individual stamps that reveal the moon when a finger is placed on the image of the eclipse, heating up the stamp. The original photograph will reappear once the stamp has cooled. The reverse side holds the path of the eclipse across the United States.